Thanks for stopping by Jo, My Gosh! I am so glad you've found me! 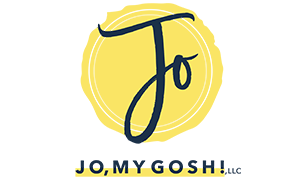 If you love Jo, My Gosh!, never miss a post by subscribing to my newsletter! By the way, this post may contain affiliate links and this blog is for entertainment purposes only. Romance is in the air… Well, maybe not quite yet, but if you’re doing a deployed Valentine’s Day, it’s never too early to get those care packages packed and sent. There are lots of ways to celebrate Valentine’s: diving head-first into the mushy-gushy-lovey-dovey matching PJ sets, getting chocolate crazy, or busting out the boudoir photos. Nothing’s wrong with any of those! But sometimes Valentine’s Day can seem so high pressure, that when you’re already doing the hard work of surviving a deployment or LDR, the last thing you need is more stress. 3. Scratch-Off Valentine Jokes: Hmm… This treat may actually cause more groans than laughs, but if your Valentine loves a solid dad joke, this will make their day. Fill out a few, or send the whole box along. 4. Conversation Hearts: If you can’t talk in person, let these classic candies do the talking for you. Necco’s classic hearts won’t melt like chocolate and this one-pound bag ensures you’re sweetie will have plenty to share. 5. I Love You Toilet Paper: It’s hard to hate a poop joke, and you don’t have to with this novelty T.P. that reads, “I love you top to bottom.” Head’s up, though–the price is a little steep for only one roll, so consider sending your cutie’s patootie some real luxury potty paper with a similar message. 6. Magic Color Scratch Hearts: Send your love 24 black hearts that magically turn into a multi-colored masterpieces when scratched, or scratch your own design and send along the extras for a little arts and crafts fun. 8. Six-Pack of Love: This cute six-pack carrier is an adorable way to tell your honey, “I miss your six-pack.” Instead of shipping beer, try filling the carrier with something your service member needs, like a half dozen socks or undershirts. Don't Miss Out! Subscribe to the newsletter for all the latest posts straight to your inbox!